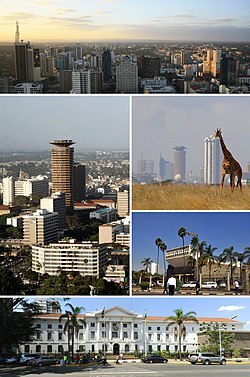 Clockwise from top: Central business district, Nairobi National Park, Parliament of Kenya, Nairobi City Hall and the Kenyatta International Conference Centre. Nickname(s): "Green City in the Sun", "Nai", "Silicon Savannah"
Nairobi ke toropo kgolo go feta diporofense Nairobi County ka moka Kenya. ↑ "Population Distribution by Political Units". knbs.or.ke. Retrieved 2015-03-30. Letlakala le fetotšwe la mafelelo ka 14:29, 13 Dibokwane 2016.